Last week's announcement of TfL taking over Croydon Tramlink included the suggestion it might acceslerate progress on the Crystal Palace extension, so I've been reading up on exactly what's planned. Here's a diagram of the existing tracks in the area (not to scale). The green dotted line shows the general route of the extension. the tram would run on the embankment, either converting part of the existing train tracks or running alongside them. The beginning of the route through Penge Road follows same lightly used branch line as the route to Beckenham Junction, and is a likely candidate for where one of the tracks could be converted. 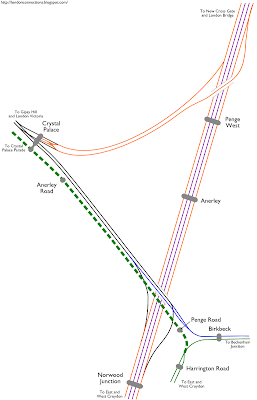 The route then crosses a junction with the Brighton Main Line (more on that later), and from here the railway is much busier and needs to remain double track, so trams will have to run alongside it to Anerley Road, mainly through people's back gardens. It was once proposed to take over the entire railway branch to Beckenham Junction (shown in blue on my diagram), with direct tram service from Crystal Palace to Beckanham Junction. This is absent from any current plans. At Anerley Road the line rises to street level from which there are several options for reaching Crystal Palace station. Finally, it runs along the bottom of the park to terminate at Crystal Palace Parade, for interchange with buses. The part of the plan that's haziest is the crossing of the Brighton Main Line, and the two junction spurs alongside it. Trams need to be fully segregated, so sharing track or having any tracks cross on the level isn't an option, making it all but impossible to use the existing bridge. And the spurs are already on embankment, so unless they have something clever planned, the bridge needed to go over the whole lot will need to be enormous. I've included two other major projects on the diagram: The purple tracks are used by Thameslink services to Brighton and eventually other places. The orange tracks will be used by the East London Line extension to Crystal Palace (where there will be new platforms) and West Croydon. As for other Tramlink extensions, the best TfL can say is they "haven't been forgotten about". Reassuring. Doesn't look like a well thought through scheme to me. CP currently has 4tph to Croydon anyway, and when Overground reaches Crystal Palace, presumably those London Bridge Circulars will be surplus to requirements. 6 tph Crystal Palace to Croydon by heavy rail must be on the table anyway, so why spend all that money on trams when the heavy rail connections are potentially just as good. Only two extra stops are added, one is just round the corner from Crystal Palace Station anyway. Penge Road looks like a useful stop on the OS map, mainly because Norwood Junction is such a poorly sited station, but effectively, the entire cost of this tramlink extension is going towards improving transport links for the area around Penge Road. Value for money? The termination point at Crystal Palace Parade is of course at the TOP of the park rather than the Bottom (where the lake is!). One solution to the grade separation problems at Bromley Junction where the chord to the Brighton Line branches off might be to run the Tramlink up and over the Beckenham heavy rail line just north west of Harrington Road, before the junction, running the line on the North side of the Heavy Rail track, avoiding fouling the southfacing chords, and taking land from Orchard Sports ground (which is owned I think by Southwark Council) to widen the embankment. At some point nearer Anerley Hill the tram lines could swap back over the heavy rail tracks in preparation for the rise to street level at the Thicket pub - 2 smaller bridges rather than one giant one.